If you’re having your roof replaced, worked on, or if it sustained some damage, shrink wrapping is a great way to keep it and the rest of your house protected from the elements. NYC Shrink Wrapping experts will get up on the roof, wrap it, and protect it while you’re waiting for the job to be done or started. 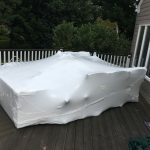 Our shrink wrapping standards are second to none, so if you are suddenly in need of protection while your roof is being fixed, contact NYC Shrink Wrapping for help.